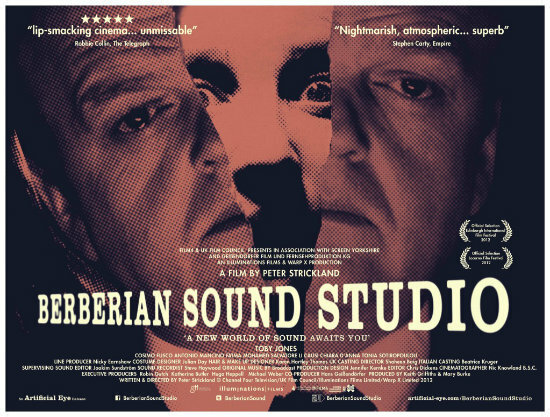 Peter Strickland’s 2012 film Berberian Sound Studio is the first popular film quite possibly since Stanley Donan’s Singing In The Rain (1952)[i], to focus its narrative around sound as a concept in cinema. As a visual medium, sound and music is often taken for granted; an assumed norm of film since the 1930s that has a texture of interweaved sound and music that can be split between attainments to realism and the exercising of creative licence. Very rarely does a film’s narrative actually set itself within the questioning nature of film sound so explicitly, especially when looking at the horror genre which, more than any other, relies on its soundscapes to create its overall effect on the viewer. However, Berberian Sound Studio (from here on in, Berberian) does more than simply create drama around a setting explicitly highlighting the production of the sound in horror films. It ironically uses the effects created to gradually subvert the linear narrative to the point where the film delves into the avant-garde for its final movement. Sound is not just being used as a narrative setting but as a narrative tool as well, making the film one of the most complex to look at in terms of sound and music. So much is happening in the film’s soundscape that it becomes almost impossible to distinguish what exactly is happening; where the reality of the film starts and where it ends. This ideal coupled with the film’s scenario and setting makes it a melting pot of techniques, tricks and metaphors that seem almost constant. The nods to the Italian Giallo movement (which will be looked at in more detail later on) appear to be one of the key contexts that critics seem to grasp on to. Yet, looking back at the actual genre and films that spawned from it, they seem tame and almost conservative in comparison when looking at their use of sound. The film within the film, The Equestrian Vortex, is accurate in the context of sound but Berberian seeks to do more than simply show the mechanical inner workings of the horror sub-genre. It instead uses this era and the weaving of its tapestry of sound as a starting point to jump off into deeper, more startling and questioning motifs. Does sound create the world of the cinema in turn meaning that its visual elements are devoid of meaning without it? The power of sound appears to be film’s main agenda and showcases throughout its Giallo inspired setting; that sound can change the context of everything. Whereas most films, horror or otherwise, seek to take advantage of the assumptions made about sound in film, Berberian is situated in an area where it can do nothing other than question everything that is heard in relation to the visual stimulus provided. This may be a film set in a world all about the building of another through sound but it is fundamentally about how other worlds desired or not, can come into existence through something as ridiculous as the destruction of vegetables. Berberian is a film roughly split into segments in a relatively straightforward, cyclic movement. Though the latter segment perhaps causes the unwary viewer to become lost in its labyrinth of experimentations and breakdowns at what appears to be a visual impending chaos, the narrative has a trajectory a line that seems simple enough to follow. Gilderoy is a sound engineer from a very typical type of Britain. He’s worked on quiet public information films about the countryside and the wildlife that inhabits it. Berberian finds Gilderoy having taken up a new project in Italy working on a film by director Santini. Upon arriving at the sound studio, he finds that the film he is working on, The Equestrian Vortex, is very different to his previous work; this film is a violent, gory Giallo in the most obvious sense of the genre and not a film about horses (“I didn’t quite know I’d be working on this sort of film”). The film requires Gilderoy to become what is portrayed as an accomplice to the crimes displayed within the film and eventually begin to break down his very grasp of reality. At first he begins with more musical elements, modulating and mixing vocals but he is soon made to start adding the sound effects for the more violent scenarios. The more humorous side of Berberian comes rather aptly from the visuals. To make the effects of women being stabbed or falling from a tower, he has to stab cabbages or drop marrows. The visual aspect of this is extremely amusing and only when the scenario of what it is meant to be depicting becomes apparent, does the sound take on a darker meaning. As Gilderoy becomes more and more disturbed by his recording duties, his reality starts to break down in the most Videodrome (1983) of ways[ii]. His only reassurance is his sound recordings from home and the occasional letter from his mother who often tells of Chiffchaffs nesting in the garden. A number of sub-plots begin to emerge, largely stemming from Gilderoy’s unfriendly producer who is determined to make the film work no matter what. He covers up for Santini’s sexual harassment of a sound actress, he bullies Gilderoy into recording more and more disturbing sound effects and manages to palm off the responsibility of reimbursing Gilderoy for his flight cost to the equally unfriendly secretary of the studio. Rather brilliantly, the latter, more surreal sections of Berberian are easy to analyse and even basically relate and discuss, specifically through discussing the relationship between sound and vision. Very few films actually produce this sort of effect with the only one coming to mind being David Lynch’s Mulholland Drive (2001) that relies on its use of music to give a reasonably solid interpretation. Berberian is the same in that this break down of reality that brings together many elements from the past hour of the film can be broken down and read by listening to it just as much as watching it. In basic terms, Gilderoy starts to find himself back in his home, slowly becoming part of a film itself. A tragic event described in one of the letters from his mother begins to become the backbone of this new reality where he is awoken by what he thinks is someone trying to break into his accommodation[iii]. He finds himself back in the studio with a film being projected replaying the last few moments just shown in the film and it gradually catches up with him until the whole film, both his and ours, violently breaks down and burns out, leaving a reality where Gilderoy speaks Italian and the tragedy of the letter becomes part of the horror he needs to soundtrack. This is the narrative’s basic structure. It does not however do the film justice as it is full of nuanced detail in its use of sound and music which is the main crux of this essay. This soundscape reinforces narrative elements as well as challenging them and even creating whole new strands that are casual in their existence. The line between reality and fantasy is blurred by the sound design, sometimes solidifying Gilderoy’s world, sometimes quite literally burning it away. It would be best then to distinguish all of these musical traits, gradually narrowing them down into sections and segments until only the most ambiguous and complex are left. It is therefore vital to establish some context of the general use of music and defining some of the Italian Giallo movement’s traits is a necessary step. [i] This is ignoring the previous year’s The Artist by Michael Hazanavicius which does experiment in some ways with sound but gives in to popular demand and even recycles Bernard Herrmann’s score for Hitchcock’s Vertigo (1958), producing a sickly and overly romanticised view of the silent era. [ii] In his Radio 5 review of the film, Mark Kermode (who named it his best film of 2012) compared Berberian to a modern day Videodrome, though ironically, the film is set even before David Cronenberg had properly broken into the mainstream. [iii] A very typical and clichéd Giallo film scenario found in even the most popular of the sub-genre’s films.